The teachers persuaded Robinson to send his son to a school for kids with behavioral disorders. But after David had been there for just a few weeks, Robinson found out that the boy was being physically restrained. So Robinson began homeschooling David, arriving home every morning at seven from his eight-hour shift on the ambulance, making breakfast for the two of them, and then teaching through lunch. After that he would steal a few hours of sleep before heading back to work and starting the cycle all over again. The grueling schedule only accelerated Robinson’s growing fatigue with life as a third-shift EMT. “I was starting to feel the burnout,” he recalls, citing what is widely held to be an inevitable fact of life for emergency medical workers. He was desperate to climb out of his job. The problem was that there was no clear next rung on the ladder for him to reach for. Robinson’s career had been a series of false starts. After serving as a military policeman during the first Gulf War, he’d studied criminal justice at a local community college for a while, then decided it wasn’t for him. He earned his EMT certification—a relatively quick credential—a couple of years later. Fully aware that ambulance work wasn’t really “a lifelong career kind of thing,” Robinson set his sights on a nursing degree, going so far as to earn all the academic prerequisites. But then, just before he pulled David out of school, Robinson ran aground in the great sand trap of contemporary American public higher education: due to a shortage of instructors, there was a two-and-a-half-year waiting list for the nursing program at his local community college. Other state schools, he heard, had wait lists as well. The system was maxed out. As Robinson’s name inched slowly up the rolls— and as he continued his routine of homeschooling by day and sirens by night—he and his wife started to discuss a new idea. For years, he had been working with kids in his spare time: at a Sunday school, in martial arts lessons, in an afterschool program for children in public housing projects. And now, with his son, Robinson seemed to be making real progress. It was a giant leap—but what if he became a teacher? Better yet, what if he specialized in teaching kids like David, kids who needed special ed? By all accounts, the country was in dire need of such teachers, and the job promised security and solid benefits, perks he had always lacked as an EMT. With newfound resolve, Robinson began his search for a degree program in special education. And for the first time in his life, he didn’t look to a nearby state college. Given his daily commitments, trucking to campus for a normal class schedule was out of the question. His best, and perhaps only, option, it seemed, was to step out into the wilderness of online education. Robinson doesn’t remember exactly how he discovered Western Governors University; he thinks he may have clicked on an advertisement generated by a Google search. He noticed that the school was accredited by the National Council for Accreditation of Teacher Education, a professional oversight body recognized by the U.S. Department of Education; that seemed promising. (WGU happens to be the only all-online school that bears that distinction.) He also noticed that the university was founded by the governors of nineteen U.S. states, which seemed a legitimate, if unusual, provenance. A phone call with an admissions counselor sealed the deal. He enrolled in July 2009. With that, Robinson stumbled into one of the most unassuming but revolutionary institutions in American higher education. Western Governors differs in several respects from the crush of online schools that have mushroomed in recent years to serve working adults like Robinson. For one thing, unlike the Phoenixes, Capellas, Ashfords, and Grand Canyons that plaster America’s billboards, Web sites, and subway cars with ads, Western Governors is a nonprofit institution. That means no $100 million marketing budget, and no 30 percent profit margin. For anyone actually enrolled at Western Governors, the biggest difference is simply its price. The average annual cost of tuition at for-profit universities is around $15,600. Tuition at Western Governors, meanwhile, costs a flat rate of just under $6,000 a year. The reason Western Governors can offer this kind of tuition (which is often, in practice, even cheaper than it looks; more on this later) is because of its signature twist on the idea of a university—a feature that sets it apart not only from its for-profit competitors, but from virtually every other institution of higher education in the country. This innovation allows WGU to offer its students a college degree that is of greater demonstrable value than what its for-profit competitors offer—and do so for about a third the price, in half the time. That value proposition is catching on with more and more Americans. With just over 25,000 students today, Western Governors is growing at a rate of about 30 percent a year, and has done so for much of the past decade. That kind of rapid expansion may not have been especially remarkable in the online education sector a few years ago, when the industry was booming, but today it renders WGU a stark outlier. After ten years of breakneck growth, for-profit colleges are in damage control mode, having found themselves the recent target of congressional hearings, scathing news investigations, and a tightening regulatory regime. New enrollments at the University of Phoenix dropped by just over 40 percent in the first part of 2011, while tuition has only increased. At Kaplan new enrollments fell by 48 percent in the same period. These collapsing numbers are not merely the short-term results of bad press. The for-profits are suffering because they have a business model that doesn’t quite work anymore; Western Governors is growing because it has one that does. To understand WGU’s big innovation, it helps to think first about the system we have now. In the United States today, a college degree can signal a variety of things. A diploma from an elite school, for instance, broadcasts the culture, prestige, and exclusivity of the institution that stamped it. But as you move down-market into the vast middle range of American schools, those institution-specific signals either become very weak—verging on inaudible—or very geographically specific. (A diploma from Louisiana State University will get you a lot farther in bayou country than in San Francisco.) And yet colleges all across this spectrum produce the same four-year credential: a bachelor’s degree. So what is the common denominator between a diploma from, say, Cornell and one from Texas Southern University? Simply put: time. At bottom, every college degree is a blunt, dumb testament to its recipient’s persistence. As a recent report from the Center for American Progress put it, a degree means you sat through 120 credit hours of coursework and didn’t fail—whatever “fail” may have meant to your given crop of professors. This way of doing things has two main drawbacks. The first is that for employers a diploma doesn’t impart all that much useful information. (What does a C student know? Half the material well? All the material by half?) The second major drawback is that for students without a lot of time on their hands—students like John Robinson—it entails a lot of sitting around. Those fixed standards enable a world of variation. At Western Governors, students aren’t asked to sit in a class any longer than it takes for them to demonstrate that they have mastered the material. In fact, they aren’t asked to sit in a “class” at all. At the beginning of a course, students are given a test called a “pre-assessment.” Then they have a conversation with their mentor—a kind of personal coach assigned to each student for the duration of their degree program—to discuss which concepts in the course they already grasp, which they still need to master, and how to go about closing the gap. The students are then offered a broad set of “learning resources”—a drab phrase, sure, but no more so than “crowded lecture hall”—that may include videos, textbooks, online simulations, conversations with a WGU course mentor (an expert in the subject matter who is on call to answer questions), or even tutors in the student’s hometown. This is where the real power of the Western Governors economic model comes in. Tuition at the school works according to the “all-you-can-eat buffet” principle: $6,000 covers as many courses as you can finish in two semesters. Given the freedom to move at their own pace, many students can finish more than a standard academic load each term. In fact, according to Western Governors, the average time to degree for people who complete their bachelor’s at the school is around thirty months. That’s a college degree in two and a half years—for a total of around fifteen thousand bucks. By comparison, most for-profit institutions—where the average time to degree is fifty-seven months—have simply found ways to shave down the overhead costs of delivering an otherwise utterly conventional college degree. “Ninety-five percent of online education in the country is really classroom education delivered over a wire,” Robert Mendenhall, the president of WGU, likes to say. “It’s still a professor with fifteen or twenty or thirty students on the other end, and they have a syllabus and assignments.” Given the academic industry standard—a hulking research university— it’s not particularly hard to find marginal efficiencies in the way higher education is delivered. These institutions are just farmers of low-hanging fruit. Moreover, while they’ve lowered the cost of producing an education, they have seldom lowered the price of acquiring one. Many for-profits have simply pegged their tuition at or near the maximum federal loan allowance, which is itself tied to the soaring tuition rates of traditional brick-and-mortar schools. This is a formula that has produced reliably fat profit margins and rising stock prices, if not necessarily high-quality educations. And it has been ripe for a takedown. Western Governors was always meant to be a revolutionary institution. Its founders simply had the wrong revolution in mind. On a balmy Sunday evening in June 1995, eighteen governors sat down around a conference table in the mountain resort town of Park City, Utah, and began trading war stories about their states’ higher education systems. It was a special closed-door session of the annual Western Governors Association meeting, and in the absence of reporters, the state executives vented. They all faced the same awful statistics: growing populations, state budgets failing to keep pace. It was painfully clear that public institutions would need to find a way to scale up drastically, and cheaply, if they were to keep up with demand. But universities were fiercely protective of their inefficiencies— and their worst-performing programs. One governor described catching hell for trying to close a barely functional veterinary school. Others had similar tales. Whenever they tried to intervene in their public higher education systems, the governors agreed, they found themselves rebuffed and ridiculed. So, right then and there, they hit on the notion of starting a new university from scratch. Not long thereafter, Kinser’s dissertation adviser actually apologized for suggesting WGU as a subject for his research. By the start of the new millennium, the project looked like a total flop. When Western Governors began accepting applications in 1998, it received only seventy-five in the first two weeks. The next year, the headline “Virtual U Struggles to Get Real” appeared in the Salt Lake Tribune. By the end of 2000, the school had all of 200 students, and a Utah auditor general was officially lambasting it for low enrollments and a failure to compete with other distance education programs. In a year that saw the ignominious collapse of Pets.com, Western Governors was hard to distinguish from all the flotsam sloshing around in the wake of the dot-com bust. By the time Western Governors finally secured its accreditation in 2003—from not just one, but four of the major regional accreditors—times had changed. The online education marketplace was an increasingly crowded bazaar. For-profit schools, fortified by infusions of capital from Wall Street and multimillion-dollar marketing budgets, had begun their decade-long boom. No longer a pure symbol of online education’s upstart potential, Western Governors was just another player looking for an edge in a competitive field. Trial and error led the university to a tightly focused approach. Initially, the bulk of the school’s offerings had been associate’s degree programs aimed at students attending college for the first time. But those students, who were relatively close in age and experience to the traditional college norm, floundered in WGU’s online, competency- based program. By contrast, adult students with some college and workplace experience thrived. Ironically, that placed Western Governors squarely in contention not with the entrenched traditional institutions that had so frustrated the school’s founders, but with the burgeoning for-profit sector. At Western Governors the average age settled at thirty-six—exactly the same as in University of Phoenix’s online programs. Western Governors was not competing with the sun-dappled quad. It was competing with the billboards on Interstate 10. The school decided on a curriculum offering bachelor’s and master’s degrees in four “high-demand” areas: education, business, information technology, and health professions, mainly nursing. (Though there are liberal arts components to the school’s bachelor’s programs, Western Governors professes no interest in churning out philosophy, English, or music history grads.) Those areas of curricular focus, too, put Western Governors on much the same playing field as many of the for-profits. But here again the school could offer something distinct. For-profit universities have often built their businesses around supplying the sort of career training that requires no external validation from a professional body. “They target fields where the credential from the university is sufficient,” says Kinser. “So you don’t have a lot of nursing programs in the for-profit sector, because there’s an external nursing exam. You don’t have a lot of law schools, because there’s a bar exam. You have legal assistants or medical assistants”—professions defined only by the piece of paper a university hands you. That, of course, frees the for-profits from an element of external accountability—but at a cost to their credibility. Western Governors attracted students at a steady clip through the mid- and late 2000s—but so did everyone else in the online degree bazaar. The economic crisis of 2008 and the ensuing waves of unemployment were pushing ever more Americans into the market for “retraining,” where a gold rush was on. As public television’s Frontline pointed out last year, some of the for-profits were spending more money on advertising than retail giants like Tide detergent and Revlon cosmetics. Western Governors enjoyed better press than its competitors, but as a nonprofit institution with a modest marketing budget it remained a relatively quiet presence. The chief regulatory threat to the for-profits coalesced in the form of something called the “gainful employment rule.” The federal Higher Education Act states that, in order to be eligible for federal aid money, career-oriented schools must “prepare students for gainful employment in a recognized occupation.” And so the Education Department set out to define “gainful employment” as a ratio of student loan debt to income. If students weren’t earning enough in the workforce to service their debts after leaving a school, the idea went, then the school should not be eligible for aid. The very premise of the rule shook the foundations of the for-profits’ business model. Their stocks dropped to four-year lows. New enrollments started to plunge as waves of bad press reverberated through the market, and as schools began reengineering their models away from the old boiler-room recruitment schemes. The entire industry was suddenly pitched against a ferocious headwind. Western Governors, however, continued to grow. The school’s enrollment was verging on 25,000 students— up from just 500 in 2003—and its yearly revenues had climbed from $32 million to $111 million. And if 2010 was the worst of years for the for-profits, it was among WGU’s best—not least because of a remarkable announcement made by Indiana’s governor, Mitch Daniels, that June. With the stroke of a pen, he declared that he was creating a new state university: WGU Indiana. With a decimated manufacturing sector, high unemployment, and college completion rates trailing the rest of the country, Indiana was desperate to graduate more students. (Hand-wringing about the value of a college education aside, the numbers are clear: bachelor’s degree holders earn $20,000 a year more, on average, than high school graduates, and enjoy 50 percent lower unemployment.) Daniels saw WGU as a way to expand the state’s raw higher education capacity, and also to catch Hoosiers who had dropped out of college years ago, giving them a clear route to finishing their degree as working adults. In practice, the creation of WGU Indiana was a wave of the legal wand; it simply meant that students could apply state financial aid toward a degree at Western Governors. But the deal also gave the school the credibility of state backing, along with some free TV spots featuring Governor Daniels himself. Enrollment in the state immediately shot up to twenty times the rate in the rest of the country. And for its part of the bargain, Indiana paid almost nothing. Startup costs for the venture were covered by the Gates and Lumina foundations. A few months later, the state of Washington signed on to a similar deal, creating WGU Washington. Rumors of talks with more states followed. Moreover, some data suggests that Western Governors does rather well at seeing older students—its target demographic—through to graduation. A 2010 study funded by the Gates Foundation and carried out by McKinsey and Company compared WGU’s graduation rate, broken down by different age brackets, to that of an anonymous but typical state higher education system. For students beginning a bachelor’s degree in their late twenties, WGU’s completion rate was 18 percentage points higher than the control. For students in their forties, it was 28 percentage points higher. Perhaps not surprisingly, only students who entered college in their late teens fared better in the conventional state system. 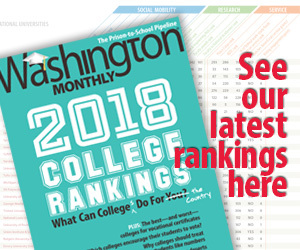 The school’s mentors are also in a unique position to survey just how arduous it can be for a grown man or woman in America to finish college and make a fresh start. A few months after John Robinson enrolled at Western Governors in 2009, he lost his job with the ambulance company. His wife had lost her job the year before. In the grim Rhode Island economy, Robinson tried his hand at running a small business, renting a storefront in Woonsocket and opening a martial arts studio. He managed to cultivate enough paying students to cover his overhead, and he started coaching a couple of mixed martial arts cage fighters on the side. But he never cleared much of a profit. And so, earlier this year, Robinson shuttered his business and moved away from Rhode Island, where he had lived most of his life. He took a job in an auto parts factory in Richmond, Kentucky, where his brother works. These days, Robinson’s schedule is more grueling than ever. He works overnight shifts that can last up to twelve hours, painting shock absorbers on an assembly line—then commutes home at five a.m. through a strange landscape of Baptist churches and fields full of cows. Robinson’s load has lightened in at least one respect, however. Soon after the family’s move, his son tried going to school for the last part of the year. The experiment went well enough, and David was anxious to play drums in the school band and join the wresting team. So this fall he is entering junior high, and Robinson is putting his homeschooling days behind him. “It had its season,” he says. While Robinson was in the midst of uprooting his life and replanting it in the Bluegrass State, he had to take a few weeks off from Western Governors; he was simply too exhausted to log on. At another school, the semester might have swept past him. But Robinson’s mentor told him, “You just do what you need to do.” When things had settled back down, he was able to pick up where he had left off. Today he is a little more than halfway through his degree in special education. No matter how much market share it seizes from the for-profits, Western Governors is unlikely to fire the imaginations of those who like to think of college as a crucible of open-ended inquiry, critical citizenship, and humanistic contemplation. But it’s worth remembering that not all crucibles look alike. Before he enrolled at Western Governors, John Robinson says, he had never written a paper in his life. Now he has written more than a score of them, and the experience has given him newfound confidence in his own thinking. “Ideas are flowing, I’m making notes of things,” he says. “When I get an idea, I write it down.” The other day, he sat down at his computer with his morning cup of coffee after sleeping off a shift at the factory and discovered, via Facebook alert, that an essay he had submitted to a Christian online magazine had been published. The education of “nontraditional” students has been a subject fraught with cognitive dissonance in America, where much of the discussion surrounding higher education is unduly preoccupied with matters of prestige and exclusivity. In this context, leaders of for-profit colleges have held up their neglected, underserved student populations as a badge of moral seriousness. “What we do is educate people who would never have a shot, thank you very much,” a former Kaplan executive said in a recent Washington Post article. In effect, the for-profit schools have accused their prestigious critics of looking at the world of working-class, adult students and saying, for all intents and purposes, “Let them eat cake.” And despite their many flaws, the for-profits have a point here. That’s why the country needs more institutions like Western Governors— innovative, low-cost schools offering degrees of demonstrable value—that put both the snobs and the profiteers to shame. In June, the Department of Education handed down the final version of its gainful employment rule. Though more watered down than some reformers had hoped, the new regulation is predicted to render about 5 percent of for-profit programs ineligible for federal aid— effectively shutting them down—starting in 2015. But just as dramatic are the effects the rule is already having on the industry, as schools clamber to reengineer their business models so as not to run afoul of Washington. Last year, 25 percent of students who attended for-profit colleges defaulted on their student loans within three years. In order to survive, schools will have to find some way to bring those numbers down. Phoenix, which not long ago compensated recruiters according to the number of students they enrolled (homeless, addicted, brain injured, or no), has instituted a mandatory three-week student orientation period. The entire sector is grappling with the shock of suddenly having a stake in its students’ success. WGU, whose model needs no overhauling—and whose student loan default rate is about 5 percent—will only benefit from its competitors’ time in the wilderness. The demand for higher education, after all, is as stronger than ever. What’s more, it may only be a matter of time before the Western Governors model begins to pose its founders’ challenge to traditional higher education as well. Consider WGU’s college of business, the school’s second largest academic program. Business is the most popular undergraduate major in America. But recently, the sociologists Richard Arum and Josipa Roksa found that undergraduate students of business learn measurably less than students in other fields. The scholars examined the results of a national essay-based exam called the Collegiate Learning Assessment, and measured how much students’ scores improved over the course of four years in college. Business students’ scores improved scarcely at all. Colleges across the country regularly administer the Collegiate Learning Assessment. But schools closely guard the results—so loath are they to reveal what their students are, or aren’t, getting out of their studies. By contrast, a Western Governors degree is a fairly straightforward testament to what a graduate knows. It doesn’t seem much of a stretch to imagine that, given the choice, employers might come to prefer the latter. Earlier this year, the Center for American Progress published a report called “Disrupting College,” by the Harvard business school professor Clayton Christensen and three coauthors. Research universities, Christensen argues, simply weren’t designed to do what we are increasingly asking higher education to do: educate students from wildly different backgrounds for jobs outside the academy in ways that can be measured and assessed. Christensen and his coauthors describe the for-profit and online schools that have cropped up over the past twenty years as a “first wave of educational disruptive innovation.” But that wave arose under a system of regulatory incentives that didn’t either reward student success or punish failure, and so it could break up against reforms like the gainful employment rule. Some schools in that first wave will survive, and others won’t. Phoenix, with its astonishing enrollment of 438,000 students, is fiercely trying to adapt—and, with its multibillion-dollar revenues, it probably will succeed. Corinthian Colleges, a large chain of schools with an average 40 percent default rate—15 percentage points higher than the average in the sector—might not. At just over 25,000 students, WGU’s enrollment is still a rounding error in the grand scheme of American higher education. The school’s curriculum is relatively narrow, and its model may require a degree of discipline and self-motivation that many students don’t possess. But perhaps more than any other institution out there, Western Governors is aligned with the new pressures shaping the higher education market. The only question is how big it can get.